-$10 Entry fee or a new unwrapped toy for a boy or girl. -There will be no charge for spectators at the show. Even if you are not showing a vehicle please stop by and check everything out, donate some money or a new unwrapped toy and show your support. I know December does get cold here in Texas but I hope to see you all out there to support this event. This is a family event so bring every one out. 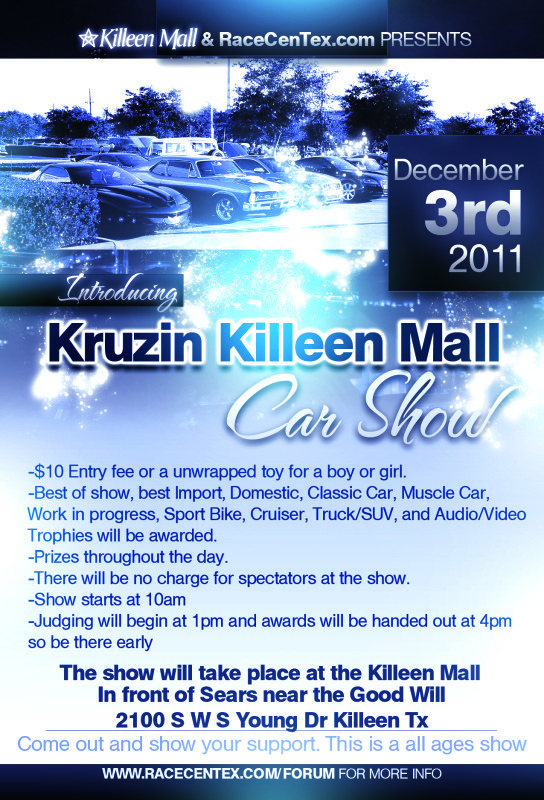 Any question please feel free to email me at [email protected] and check out Kruzin Killeen Mall Car Show Dec 3rd (Charity Car show) for all the updates. Any one attend the charity event at the Ridge last year?